First, a word or two about the restaurant itself. Despite having six floors to their name (level 1 – 3 for common diners of which most of us are, level 4 – 6 for VIPs of which I have no idea, nor the interest to find out, how to become one), I was given a table only at 9.15 p.m. when I called that afternoon to make a reservation. However, upon reaching the restaurant I saw countless empty tables, which made me wonder why the late reservation in the first place. Was it an attempt to make Yung Kee less available than usual? Anyway, we were seated at Level 3, and there’s an elevator to take you to the different floors. 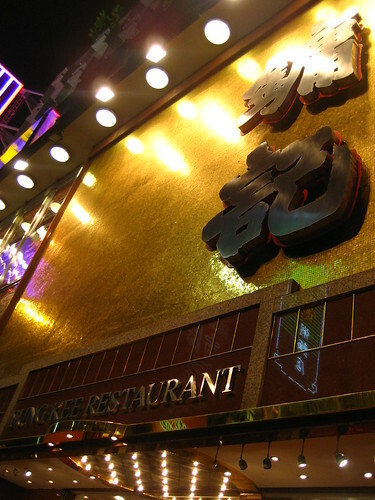 The place was gleaming and classy for such a traditional restaurant. 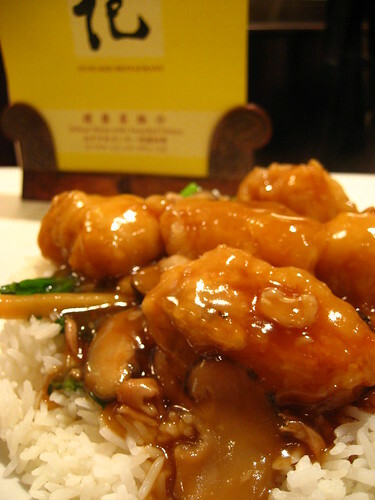 No evidence of stained table cloth or musty smell which clogged many a Chinese restaurant in Hong Kong. As we perused the menu, the waitress was, for the lack of a better word, extremely pushy and kept recommending us overpriced morsels of seafood. Each priced at hundredss of dollars, no less. She got onto my nerves so much that I told her to leave us alone so that we can make our own decisions. She left in a huff. I was not surprised. I would want to use stronger language here, but hey, I am a nice guy. LOL. 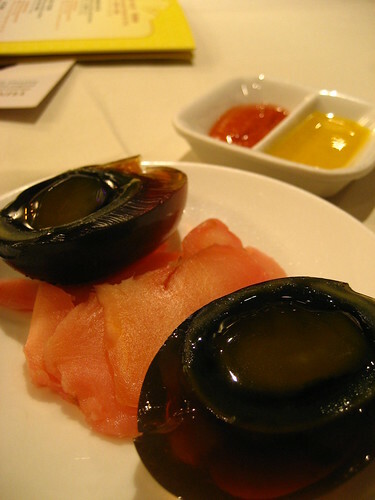 Century Eggs, HKD8 per portion. Don’t be deceived by the default dish of century eggs, placed on your table before you even placed order. One portion of the famous eggs is actual half an egg. That said, it was so delicious that I ordered another two portions. Century eggs can be quite an acquired taste. 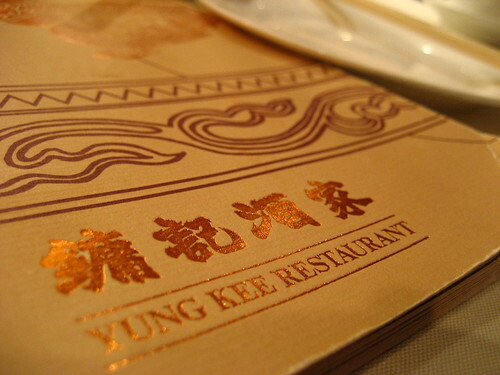 However being a fan of this Cantonese cuisine, I can safely vouch that Yung Kee’s was the BEST I ever had. It was fragrant, crystal clear (well, as clear as a piece of black egg can be) and smooth to the bite. Coupled with sliced gingers it was clearly a masterpiece. I could not give it higher praise. 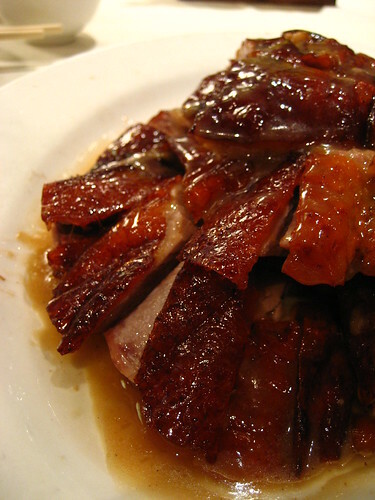 Roast Goose, HKD220 for half a goose. Now this was what thousands of diners before me flocked to Yung Kee for. I was expecting crisp skin, succulent meat with a heavenly side dip. I didn’t even mind that that roast goose is a calorie bomb. But alas, I was disappointed. The dish arrived lukewarm, with oil literally congealing all over the goose. The skin was crispy at places, but most of the meat was like biting into rubber. The only saving grace was the side sour plum sauce, which is not much to rave about. Either the dish was pre-prepared by the plates so that they can serve customers fast, or the quality really nose-dived when you get your table past 9 in the evening. Either way, it was a total waste of my calorie quota. 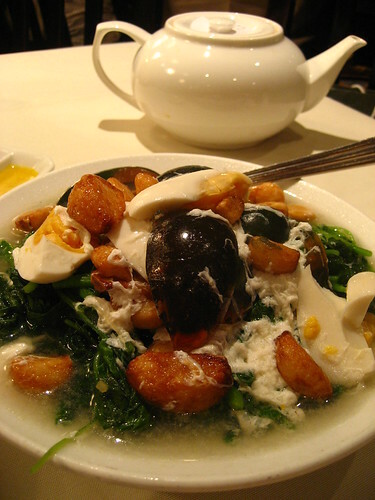 The vegetable was fresh, the three types of eggs (normal chicken eggs, salted eggs and century eggs) were an interesting combi. Cooked with a heavy hand of garlic cloves, this dish was good for second or even third helping. Reasonably delicious to invoke the appetite in me after the disappointing goose. One thing admirable about this dish was the impossibly large chunk of fish fillets they used. How in the world did they manage to cut a fish to produce such thick, juicy fillets? I can only imagine the size of the fish. It was rather well done, as the fish chunks were undeniably fresh, though I do wish the taste of the gravy is more gingery than it was. Those who know me will tell you what a big fan of egg tarts I am. When I saw the delicious looking tiny egg tarts at the next table (which, coincidentally, was a family of Singaporeans… you can’t miss their Singlish for the world), I had to order some for myself. Alas, it was the biggest disappointment for the night. There was nothing Chinese with the crust. It was way too butter-cookie-like to even remotely resemble an authentic Chinese egg tart. As for the filling, it tasted like slightly sweetened jelly. 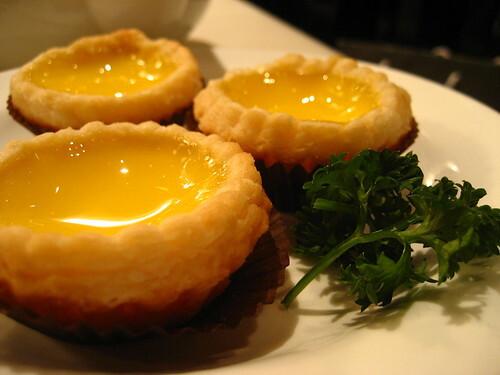 I had much better egg tarts elsewhere at half the price. With tea, towel and 10% service charge, the total bill came up to about HKD540. Both my friend and I agreed that, while this was certainly a rather jolly first experience at Yung Kee, it was one neither of us would care to repeat. Apparently this place has a One Michelin (a grading system I am still struggling to understand), and I can see why. The place has a history, the food has been raved upon by some of the most cynic food critics, and it is true some of the food is actually pretty good. However, for now, the only reason why I would return is to sample their heavenly century eggs again. How strange that the cheapest dish for the night was also the most memorable. Updated: Here’s a complete list of restaurants in Hong Kong and Macau with Michelin Stars. I am ashamed to say Yung Kee is the only one I tried. Oh well, century eggs yes. The rest no. PS I think that Michelin list is the 2009 one as Bo Innovation still has 2* and is now only 1*! Century egg is an acquired taste. I liked your description how it “looked every colour that an egg shouldn’t”. Haha. Have you eaten your way through the Michelin list?